This gorgeous bow is made of a classic black satin ribbon topped with an overlay ribbon of black with gold sparkly edging. 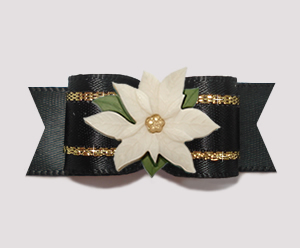 Securely stitched to the center of this classically styled bow is an ivory poinsettia with gold center. Simply beautiful!